Relax and reconnect with family at Moose Point Lodge in the spectacular Canadian wilderness. The only calls you will receive are from an occasional loon. And the crystal clear visual on our "big screen" that spreads across the horizon is second to none! 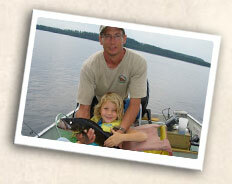 Moose Point Lodge is an ideal place for families or couples. Our five homey private cabins are located along a large sandy beach; a great place for swimming and canoeing after an exceptional day of fishing and exploring. For additional family fun, we offer a trampoline raft, paddle boats, canoes and beach accessories. Give the entire family something to smile about. Get away to Moose Point Lodge. Call and ask about our special July and August family rates. 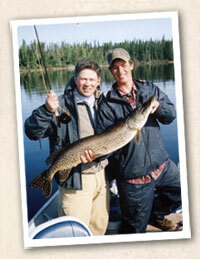 Your corporate getaway at Moose Point Lodge will leave your staff siging you praises. What better environment to stimulate ideas, thank the team for a job well done, or treat your top clients to a week away. We can easilty accommodate any group up to 30 people. To meet your business needs, we have available wireless high speed Internet access, a television and DVD player, as well as radio phone and fax. Fish in the morning and have an indoor or outdoor meeting after a shore lunch. You'll find the breathtaking view truly inspirational. What could be better than a week of fishing for trophies with your best buddies? 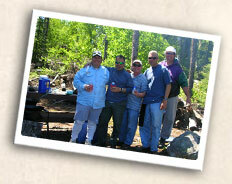 Become one of the regulars who make Moose Point Lodge a favorite annual tradition with friends.